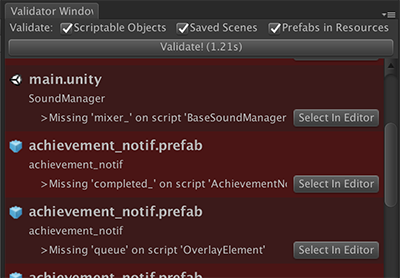 Tool for validating (ensuring no broken / missing outlets) objects like GameObjects, ScriptableObjects, etc, in the Unity Editor. It’s so easy to break outlets by renaming functions, removing assets, losing .meta files, etc. DTValidator finds missing outlets (any UnityEngine.Object exposed in the inspector), broken UnityEvents, and missing MonoBehaviour scripts. More importantly, it’s easy to set it up as a unit test for integration with your build pipeline. Read more about DTValidator here. Download the DTValidator project from this repository by pressing this link. It should automatically download the latest state of the master branch. Place the downloaded folder in your project. I recommend placing it in the Assets/Plugins directory so it doesn’t add to your compile time. Now you have unit tests running to validate your project! Try running them by opening the Test Runner window under Window->Test Runner. It’s likely that you’ll have errors in your project - that’s okay! Most likely the errors will be outlets that you need to mark [DTValidator.Optional]. See the FAQ for the best approach to deal with these errors. To find and fix these errors, open the DTValidator Window under Window->DTValidator Window. Now press the Validate button and all the errors will show up. You can see where the error originated from and even highlight the object in the editor. Go through each error and determine if it’s an actual error or if it needs to be marked [DTValidator.Optional]. Once you’re left with no errors, you’re done! Now set your build system to run unit tests for every build. You can now easily find and check new validation errors when they come up. Q: I have an outlet marked as an error, but it’s fine that the outlet is missing. How do I fix this? A: Mark the outlet as [DTValidator.Optional] and the validator will ignore checking the field. Q: There are a ton of optional outlets for this plugin I downloaded, is there an easier way to deal with these errors? A: Yup! Mark the entire plugin namespace as optional by creating a ValidatorIgnoredNamespace. Right-click in your project and go to Create->DTValidator->ValidatorIgnoredNamespace. Q (advanced): There’s an outlet that is usually required, but in certain conditions it’s optional… can we handle that case? See the default included whitelisted classes (under DefaultIncluded/WhitelistedTypes) for more examples! Q (advanced): I found an error that the validator doesn’t mark as an error! Q (cont): It’s not a field on a Unity component! A: Open an issue with your specific case and I’ll take a look at it 😁. Don’t see your question answered here? Open an issue!